I know it might seem like it, but my transition to a clean, vibrant, healthy diet didn’t magically happen overnight. I didn’t wake up one morning and start slurping kale smoothies and mowing down alfalfa sprouts. It took time, evolution in my taste buds, and some redefining of what I saw as food. And thankfully, there were a handful of store-bought products that I was able to lean on to get me through those first few weeks. Yes, whole foods always trump anything you can buy in a box, carton, or can, but there is no shame in using such things to aid your transition into healthier eating. And with consumers becoming more conscious in recent years of what’s going into their food, many companies have responded by producing some really great products that you don’t need to feel so bad about bringing home. In fact, I would encourage you to seek out a few substituion and convenience products if you think they’d be helpful. Giving your diet a makeover can be overwhelming, especially if you’re switching from something close to the Standard American Diet to a whole foods, plant-based regimen. Rather than shooting for a marathon your first time on your feet and deciding that running is awful because you collapsed a mile or two in, take baby steps. Set yourself up for success. Often times this means you’ll need a little help until you’re ready to go all-in. Below are a few of the products that were staples for me during my first month or so of plant-based eating, plus a recipe that helped me through those would-be afternoon snack attacks. Maybe some of these things will help you on your journey as well. Disclaimer: I was not compensated in any way for my mention/review of the below products. These are simply things that I have enjoyed and want to pass along. These fabulous bars used to be a breakfast staple for me. They’re date and nut based, so they contain lots of fiber, protein and healthy fats. Including the dates and nuts, these guys list only about 6 ingredients each—all of them easily pronounceable. And luckily, they come in such a wide variety of delicious flavors that it’s hard to grow bored. Even though I’m now starting my day with green smoothies, Chris and I still make sure to bring along a few of these when we’re traveling or when food situations are uncertain. All Larabars are gluten-free and most are vegan (some of the newer bars containing chocolate chips may contain traces of milk). I now happily make myself lunch every day, but, for a long time, if lunch wasn’t easy I skipped it—or I’d pick through the cupboards and snack until I was sated. Not ideal. Knowing this tendency, I started buying pre-made soup so that I could have something quick and easy to rely on for lunch. This soup is pretty filling on its own, but I’d pair mine with a few Mary’s Gone Crackers for a little texture and variety. Definitely a light yet satisfying meal. Imagine’s Creamy Organic Soups don’t contain any crazy ingredients and come in a ton of great flavors, most of which are vegan. Also, as far as I can tell, they’re all gluten-free (always make sure to check labels to be certain). Probably the product with the fewest redeeming qualities on my list, but mac and cheeze-with-a-“Z” was certainly the kindest way to quell those cravings when I first went vegan. It’s made with Daiya, the vegan cheese that nearly everyone loves, and is soy-free to boot. I sort of can’t do it anymore, but man was it a welcome indulgence early on! This was my go-to smoothie every afternoon for weeks. 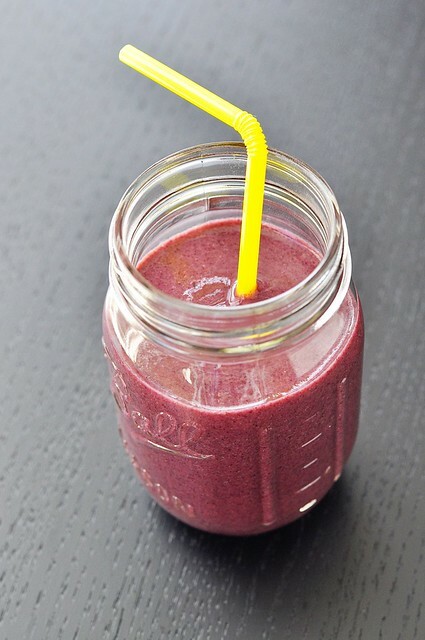 The combination of bananas and berries makes it naturally sweet and creamy, and the addition of psyllium husk powder makes it super filling. Psyllium is essentially pure fiber, and, when wet, forms a viscous gel (this is why some people like to use it to replace gums in gluten-free baking, though I personally find it results in poorer structure and odd mouthfeel). Like other soluble, gel-forming fibers, it keeps you feeling full and also helps to pick up and carry out any stragglers in your system, like cholesterol and toxins. Drinking one of these never failed to help me through the afternoon slump. 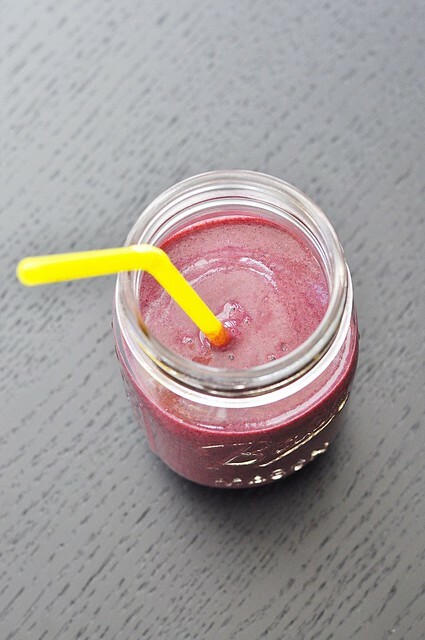 The measurement of berries in this smoothie is based on 1/2 of a bag of frozen, organic berries (any kind will do), which usually ranges from 8 to 10 ounces. If you have a scale, feel free to weigh it out, or just eyeball half the bag. Since the psyllium is basically pure fiber, if you currently eat a diet that’s low in fiber you may want to start with half a teaspoon of psyllium and work your way up so that your system can adjust. Also, the amount of non-dairy milk is at half a cup to keep the smoothie light, but feel free to omit the water and use a full cup if you’d prefer. 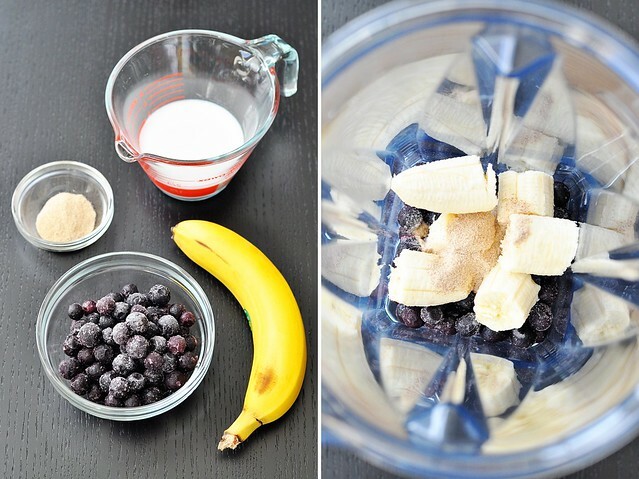 Combine all the ingredients in a blender and blend on high until very smooth. Serve cold. © GF in the City » http://www.gfinthecity.com.